Bethel World Outreach Ministries International (BWOMI), is a network of global kingdom-communities with a passion for fulfilling the Great Commission. BWOMI is an instrument of God which brings together numerous ministries in a concerted team effort to accomplish the goal of world evangelism. BWOMI was founded in August 1990 in Washington, DC metropolitan area with Dr. and Mrs. Darlingston G. Johnson as its founding pastors. This ministry is successfully creating a network of missionaries, pastors, evangelists, and Christian workers who are effectively laboring in many nations around the world for the glory of our Lord Jesus Christ. With a global outreach of more than 150 churches, Bethel offers an exceptional opportunity to be a part of a ministry destined to make a crucial impact for Jesus Christ. Bethel World Outreach Church, aka the City of Hope, is an exciting, friendly, serving church. We are comprised of people from more than 45 nations and cultures, committed to building community, strengthening families, producing leaders, and enriching lives. Our mission is to win the lost at all cost and make as many disciples for Christ as we possible can in our generation. Bethel World Outreach Ministries was founded in August 1990, in the Washington, D.C. metropolitan area with Dr. and Mrs. Darlingston G. Johnson, as its founding pastors. The first service was held at Blackburn Center, Howard University with 17 persons present. A few months later, the church relocated to the Armory Place in Silver Spring, Maryland, and then in 1992, it moved into its current facility at 8242 Georgia Avenue. Our growth has been steady and significant. In 2007, we opened a new location in Clarksburg, Maryland (Bethel North), meeting at the Clarksburg High School, to meet the needs of the community in upper Montgomery County. Then in 2009, we acquired and renovated a YMCA building in the heart of the Montgomery Village Shopping Center in Gaithersburg, Maryland and moved our Clarksburg services there. That facility was called Bethel North. 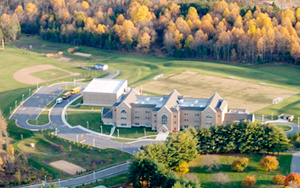 Today, God has blessed Bethel with its current location on 60 Acres of land in Olney, Maryland, complete with a 68,000 Square Foot educational building and a gymnasium. Today, more than 2500 members from over 51 countries around the world gather weekly. We are reaching out to nations and demonstrating the love of Christ by establishing local churches in needy areas, conducting evangelistic and revival meetings, building schools, training centers, and clinics, providing humanitarian services to the needy, investing in economic empowerment projects, and developing capable leaders for the global harvest! For more information, please visit cityofhope.bwomi.org.